Last week monday, the title on the daily comment was "not looking good" and the weekly was on a similar tone. Now that we've hit our target, we're back to our drawing board trying to make some sense out of our charts. Markets being largely correlated, so please also read the ER report below. This is where we certainly have to remain cautious. 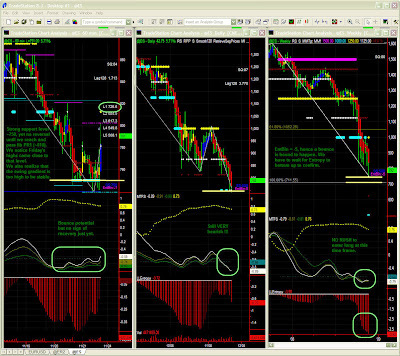 Our indicators are still bearish even if immensely oversold. Secondly, the 750 level appears a little weaker, so while we are moving away from danger zone, we're certainly not out of the woods yet. We'll wait for a blue bar, a channel breakout and MM/Fib levels to go long at this time frame. For the time being, we remain short with tighter stops or flat. Here as well, one should certainly aim at a quick turnaroung and start buying frantically already. The situation is similar to the daily chart i.e. bearish and at the same time very oversold. Volatility may push players to test 710 and then only call for the end of the game. As we've seen in other markets, we do have some indications of a pending turnaround, which i call a change in mindset, but it is in no way confirmed on our charts yet. - Today's chart snapshot is commented. - Like for ER, daily updates will be posted on this blog this week again. 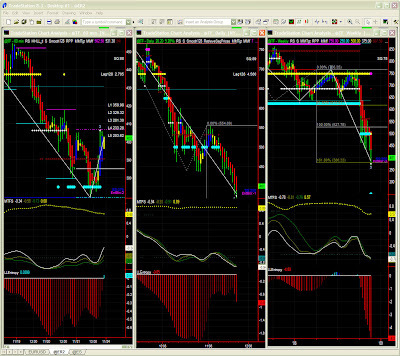 Dominant TF: Daily, 60mins with the weekly chart naturally a little behind in this volatile environment. Market Direction(daily): some will take a chance going long with a stop below recent lows. Options (RUT): a Dec put spread is quite possible. Last week monday, the scenario for the week was pretty clear, and we anticipated the fall quite well. But now that the purge is done and targets have been hit, what next ? EURUSD: The daily reports last week have been pretty accurate, anticipating a drift to range lows around 1.245. We now have a recovery attempt and 1.27 is our immediate target. Our weekly chart also confirms the likelyhood of a bottom, but we'll wait for all time frames to agree on a turnaround. At this juncture, the € could strengthen only very slowly, and even stay subject to short term volatility. In a way, it may be a change in mindset rather than a definite signal just yet. ER is climbing back ground lost last week with hurdles mid way (32points segments again) and ultimately having to face a serious test level at ~440. In the short term, a bounce is more than likely as 380 is a STRONG suppport level, but we don't see any freedom to go high quickly as we have an enormous downward pressure to dissipate first. Aggressive short term players chould however have taken a chance and be long already with a stop below the 375 support level. We may also wait for a confirmation in higher time frames. One could say that a bottom scenario is likely, but is not yet as clear as for EURUSD. One may be in a hurry to get back into buying but this time frame should nonetheless help keep our cool. There is no rush to go long unless if one really wants to try and pick a bottom. All pointers are still down, so one may want to wait for an entry point later one this week. Last week, i mentioned that TRUE support would be 380. It sounded almost impossible and yet nothing surprises anymore with these markets. Now we've hit it and while we would like to see it as the ultimate bottom (and it could well be! ), we have a LOT of negative pressure to dissipate, and we've all seen how much volatility those turbulences of energy have caused. Again, we must prepare for a potential change in mindset, but we should NOT rush into buying as our chart DOES NOT show any indication of a recovery in the short term.